Can anybody tell me about these Marlin buckles?It is dated 1996.Sorry about the lousey pictures,best I can do. Catherine and AZsparrow like this. I got one when I bought my 1894D Cowboy Carbine Limited (CCL) in 2000. Can't remember if it was included in the box from the factory or just a pot sweetner from the dealer I bought it from. I know he did toss in a couple of boxes of 44-40 ammo in on the deal. I still have the buckle on my pistol belt. Also got a set of Marlin screwdriver tips then too. ETA: I'm thinking I remember seeing them advertised on the Marlin website for sale about the same time. I have one, it’s also dated 1996. Got it for shooting in the Ranch Dog Postal Match. At one time they were offered at the Marlin website, probably around 1998 to 2000 if memory serves me correctly. Not sure if they were ever included in the box with a rifle or not. From what ya'll have said,I gather they were sanctioned by Marlin Firearms and originally only available through Marlin.I know I see dozens of buckle patterns from Remington,S&W,Colt,Winchester and others and only a few patterns and scarce at that from Marlin. Mine was probably just tossed in as a deal sweetner from the dealer I got my CCL from. We were both working on each other pretty heavy on that one. Me trying to get him to come down on the out the door price and him trying to get me to go ahead and buy it. A friend gave me a Winchester belt buckle. It's nice enough but I plan to look this gift horse in the mouth and sell or trade it away and get a Marlin buckle. Anyone have one available? I'd like the Cowwboy type. I have but one thing to say about that belt buckle: I WANT ONE!!!!!! "I have a conviction that it's only when you are put at full stretch that you can realise your full potential. " Buckles. Marlin never authorized a commercial company to manufacture and sell a Marlin belt buckle. However, the company did authorize The Marlin Firearms Collectors Association, Ltd,- a non profit organzation- to have manufactured and to sell two different variations of belt buckles. The first type was a 2 1/2-in. diameter solid pewter buckle having The Marlin Firearms Co.- Since 187Marlin in a circle around the Marlin "Danger ahead" horse and rider logo. The second type was a rectangular solid bronze buckle. It is 2" x 3" and accommodates belts up to 1 3/4 inches in width. 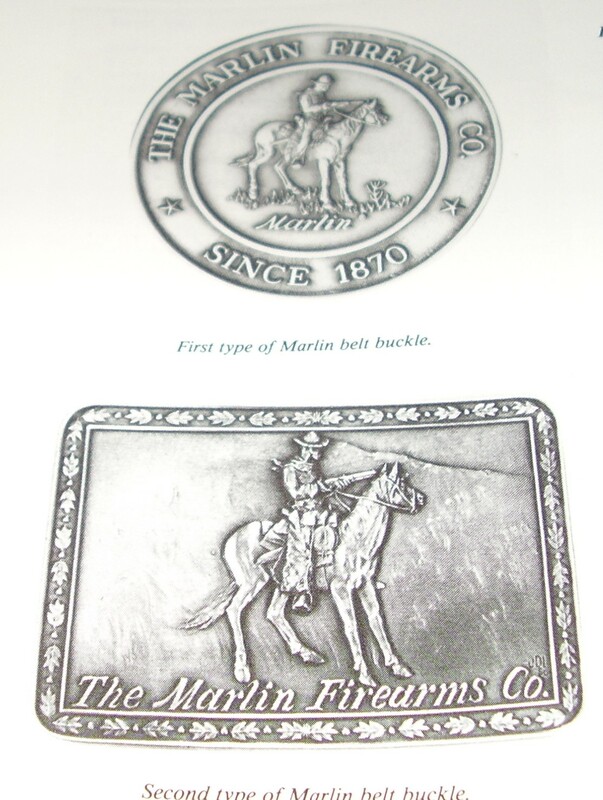 This buckle also has the horse and rider logo centrally located over the Marlin Firearms Company name. The sculptor was the world-famous artist Joseph DiLorenzo. A total of 827 of the first type were manufactured and sold by the association. A total of 500 of the second type were struck. A special run of 103 solid sterling silver buckles of the second type were also produced. They were sold only to Marlin employees and the members of the association. All our life we trade our time for money, hoping to make enough money to do what we dream of, before we run out of time. Never remove a fence without learning why the fence was put up in the first place.